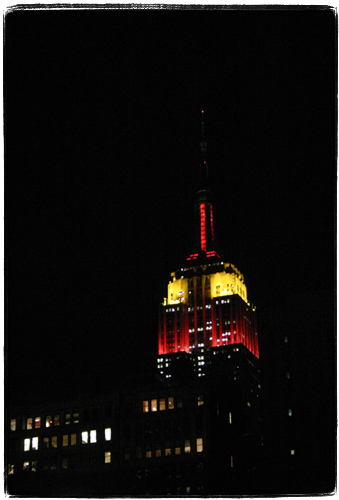 Empire State Building is lighted Red/Gold/Red today. Handy ESB lighting schedule tells me that this is in honor of Subway Centennial. A better color would have been a rusty gray-brown, the color of steel dust that covers the tracks and most other subway surfaces, but I guess they don’t have lights like that, do they? 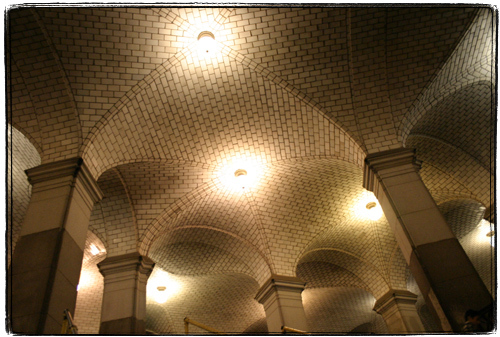 To celebrate Interborough Transit Corportation’s 100’s birthday I decided to try and sneak a peek at the fabled City Hall station, the one where Mayor Bloomberg and a bunch of bigwigs recreated Mayor McClellan’s ride 100 years ago. It’s nice to be NYC’s Mayor – you can fly NYPD helicopters and drive antique trains. Unfortunately the restored City Hall station was not open for regular shmoes, but I tried the old trick – taking 6 train through the last stop. Number 6 loops through the old City Hall station without stopping. I asked the conductor to let me stay, but since it was around 8PM she said – “not at this time of night” and kicked me out. I went for a walk around City Hall and took this picture of the pretty entrance to the current City Hall station. When I took the train back I saw the most upsetting sight – there was an intoxicated bum sleeping in a middle car with the conductor not paying any attention to him. He was holding an empty popcorn bag an there was small sea of popcorn and other rat attracting garbage around him. Apparently he went through the loop unharassed, although the old City Hall station was of no interest to him. I guess next time it would probably be a good idea to try asking a few conductors – maybe some are not as strict. This is like living in Manhattan – Donald Trump in his tower, a bum in a box on church steps, a low income person in a housing project. Middle class not allowed. On the bright side, tomorrow the special museum train will be making regular stops on the B/Q line between 10AM and 3PM. They call it “Catch me if you can“. Next PostNext How Are We Gonna Live a Few Years Without a Total Lunar Eclipse?